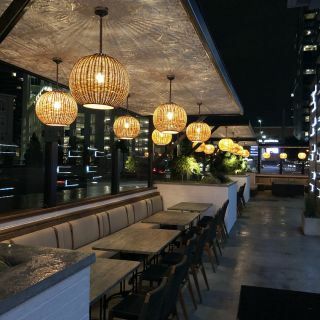 Little Alley Steakhouse recently opened a second location in the bustling Atlanta district of Buckhead. AV systems integrator Kermit Harrison Technology Solutions installed a Bose EdgeMax system comprising six EdgeMax EM90 speakers and two EdgeMax EM180 speakers to cover the main bar and lounge areas. A distributed sound system covers the rest of the establishment, including an outdoor area, using approximately two dozen Bose FreeSpace DS 40SE surface-mount loudspeakers. Harrison also said that the slim FreeSpace DS 40SE speakers sound great and have a shape that perfectly fits with the 120 LED lights mounted on the outdoor part of the restaurant. “Also, we were able to cover the entire restaurant using fewer speakers than we would have with another type of speaker, so the economics made sense, too,” he said. Bose Professional EdgeMax in-ceiling loudspeakers feature proprietary Bose PhaseGuide technology with high-frequency compression drivers to create a new category that combines the room-filling coverage patterns typical of larger surface-mount speakers with the architect-preferred aesthetics of in-ceiling models. Designed to mount near wall-ceiling boundaries, EdgeMax loudspeakers provide improved audio quality and coverage, while reducing the number of required units, compared to conventional dome-tweeter ceiling speakers.